By Aman Tiku / Oct. 21, 2018, 8:06 p.m.
Hardly a week goes by in downtown Tokyo without hearing a right-wing propaganda vehicle—called a gaisensha and owned by Japanese ultranationalist groups—blasting militaristic talking points. Japanese nationalism is very much part of the political dialogue in Japan today: after his re-election, Prime Minister Shinzo Abe, who will likely become Japan’s longest-serving post-war Prime Minister, has been given a mandate of sorts to eventually revise the country’s pacifist constitution and reinvoke nationalist elements in Japanese society. A symbol of this nationalism, Yasukuni Shrine, illustrates the contentious nature of modern Japan’s struggle to define itself and what it wants to be as a nation. Yasukuni Shrine—once known formally as the Imperial Shrine of Yasukuni—is a Shinto shrine in the Chiyoda ward of Tokyo, Japan. Emperor Meiji established the shrine in order to honor and commemorate the sacrifice of Japan’s war dead: those who died serving the Japanese state and nation. Yasukuni Shrine was quickly expanded to memorialize all those who perished during Japan’s wars in the Meiji, Taishō and (early) Shōwa periods. However, the shrine has caused significant controversy in recent history due to its enshrinement of Japanese war criminals from World War II. In addition, the Yūshūkan, a Japanese war history museum paired with Yasukuni Shrine, has been accused of engaging in historical revisionism to exalt Japan’s past militarism during and immediately preceding World War II. Examining Yasukuni Shrine and the Yūshūkan can help us to understand how the nationalism that motivated Japan’s actions during World War II continues to linger and spark disagreement in the present day. More importantly, the survival of these sentiments in Japan’s national memory has deep implications for Japanese identity, domestic society and international relations. At stake, then, in our understanding of the controversies associated with Yasukuni Shrine and the Yūshūkan, is the extent to which Japan continues to be plagued by the mistakes of its wartime past—and how Japan can overcome its own history moving forward. The enshrinement of the war dead (and of war criminals particularly) at Yasukuni Shrine and the historical narrative displayed at the Yūshūkan together create substantial complications for Japan’s national identity; this conflicted Japanese national identity is divisive for Japanese society and hampers Japan’s conduct in international relations. The enshrinement of the war dead at Yasukuni became a principal issue for Japan in 1979. The religious officials in charge of the shrine, which was removed from state control after World War II, announced unexpectedly that “fourteen military leaders who had been found guilty of war crimes by the Allied Tribunal had been enshrined.” This decision proved to be extremely provocative. Emperor Hirohito himself was thoroughly displeased by the war criminals’ enshrinement, and he immediately began an imperial boycott against visiting Yasukuni that has continued under his son Akihito. Many right-wing Japanese politicians, however, have nonetheless visited Yasukuni. Previous Prime Minister Yasuhiro Nakasone, who worked to revitalize Japanese nationalism and supported the shrine, visited Yasukuni in 1985 on the fortieth anniversary of Japan’s defeat in World War II, marking the “first official visit” to Yasukuni by a head of the Japanese government since the war’s conclusion. Ensuing visits by Prime Minister Junichiro Koizumi (six times from 2001-2006) and Abe in late 2013 sparked national and international disagreement. The “Yasukuni issue” is often cited as a recurring symbol of Japan’s “history problem”: that is, the “commemoration of the Asia-Pacific War,” the “lack of atonement for the war,” and the “absence of reconciliation with the Asian victims of the Japanese Empire.” Even so, former Prime Minister Koizumi defended his decisions, at the time explaining that: “we should not wage war again and that we must not forget the sacrifice of those who went to war and died.” That being said, the enshrinement of war criminals at Yasukuni (which is omitted from Koizumi’s comments) serves to capitalize on Japan’s national mourning to resuscitate Japan’s nationalism as it flourished under State Shinto. The Yūshūkan is often overshadowed by Yasukuni Shrine, but the war history museum ought to be considered as equally contributing to the issues that are often attributed to Yasukuni alone. Dutch historian Ian Buruma, in his book The Wages of Guilt: Memories of War in Germany and Japan, labels the Yūshūkan’s exhibitions and textual displays as “straight wartime propaganda.” He describes some of the wording used by the Yūshūkan: the “necessary” 1931 annexation of Manchuria to protect Asia from the USSR and China; the “inevitable” nature of Japan’s war against China; and the characterization of Japan’s war with the United States as “a matter of national survival.” Buruma quotes a history book sold in the museum’s bookshop to sum up the Yūshūkan’s historical narrative: “‘the Greater East Asian War was not a ‘war of invasion,’ but just the opposite: it was a holy war to liberate the world from Communism.’” But simply concluding that the Yūshūkan glorifies past Japanese militarism is too obvious and unspecific. Indeed, the Yūshūkan serves a dual purpose that mirrors that of Yasukuni Shrine, which, on the one hand, aims to commemorate the war dead, while on the other, somewhat vindicates war criminals and perpetuates elements of State Shinto nationalism. The enshrinement of war criminals at Yasukuni Shrine and the historical narrative advanced by the Yūshūkan have direct implications for Japan’s national identity. In fact, one would be remiss not to consider the influence and sway of the nationalist forces engendered by the Yūshūkan and Yasukuni. Mark Selden, a senior research associate in Cornell University’s East Asia program, notes that “Japan’s Yasukuni problem is inseparable from the fact that nationalism continues to function as arguably the dominant ideology of our era.” The difficulty at hand, to be clear, is not the remembrance of the war dead. Modern nation-states commonly praise the sacrifices of those individuals who die in service of the state, be they military or civilian—the United States itself is no stranger to this experience. What makes Yasukuni uniquely problematic is the fact that “the symbolism of Yasukuni is distinctive in its particulars” in relation to Japan. The manipulation of emotion to inflame nationalist feelings is employed at Yasukuni in parallel with an “alchemy of amnesia” at the Yūshūkan that intentionally omits certain atrocities and crimes from Japan’s national memory. Benedict Anderson argues in Imagined Communities that nationalism “has everything to do with invented tradition”; Selden points out that nationalism (in Japan’s case but also in other instances) is “equally” about repressing historical truths that cannot be amalgamated into a given agenda. Yasukuni Shrine and the Yūshūkan hence allow the nationalism of Imperial Japan to persist in continuity in modern Japan, creating a situation where Japan’s national identity is actively contested between proponents of Japan’s imagined history and opponents of such a revisionist outlook. Though all nation-states experience internal social and political friction when framing their national identity, the battle over Japan’s modern-day character produces specific troubles domestically and internationally that are worth scrutinizing more extensively. The Yasukuni issue extends beyond Japanese politics and into the lives of individual citizens too, who have no interest in the revival of State Shinto or of Japanese nationalism. There are those in Japan whose “tears of pity for lives lost are intimate and personal, and have little to do with country, honor, and duty, the usual messages of war memorials.” The narrative put forth by Yasukuni Shrine and the Yūshūkan shows a lack of genuine empathy for the Japanese who seek to retain their personal memories of the war dead rather than allow their emotions to be exploited with nationalistic intents by their nation-state. As such, the role of Yasukuni in determining Japan’s national identity is a political and social tug-of-war at home. Yasukuni Shrine and the Yūshūkan have similarly created longstanding international issues for Japan in the postwar period. When Koizumi went to Yasukuni, he “antagonized not only China and Korea, but also the people of other Asian nations and the US.” As a consequence of Koizumi’s actions—in conjunction with controversies concerning nationalism in Japanese textbooks and educational materials—Japan’s relations with both China and South Korea soured from 2001 to 2006, as China and South Korea reacted with vehemence to his Yasukuni trips. Yet Japan’s right-wingers also see a real need for nationalism due to Japan anchoring itself to the United States’ power. As Selden argues, Japan’s committed military subordinance to the United States generates the need for domestic nationalism. Further, the “rising stature of South Korea and China in international society” has aggravated “memories of Japan’s past aggression for many South Koreans and Chinese.” A 2014 opinion poll showed that an overwhelming majority of both Chinese and South Koreans had a negative view of Japan and of its current leader. Japanese views of China and South Korea, according to a government survey that same year, were equally pessimistic. Thus, beyond Japan, East Asian countries find the enshrinement of war criminals and Japanese historical revisionism deeply upsetting even as Japan searches for ways to maintain its domestic cohesion and international position under America’s wing. The issues represented by Yasukuni Shrine and the Yūshūkan are necessarily difficult because each and every group with a vested interest in the subject brings their own histories, memories, and preconceived judgments to the ongoing dialogue. The enshrinement of the war dead at Yasukuni Shrine and the revised historical narrative disseminated at the Yūshūkan have put tremendous strain on Japan’s national identity, domestic discourse and international relations. In any case, Yasukuni “will remain controversial as long as prime ministers insist on making an issue of it.” Nonetheless, if the Yūshūkan and Yasukuni Shrine have demonstrated anything, it is that discussions revolving around historical and national memory reverberate in the present and set a tone for the future. 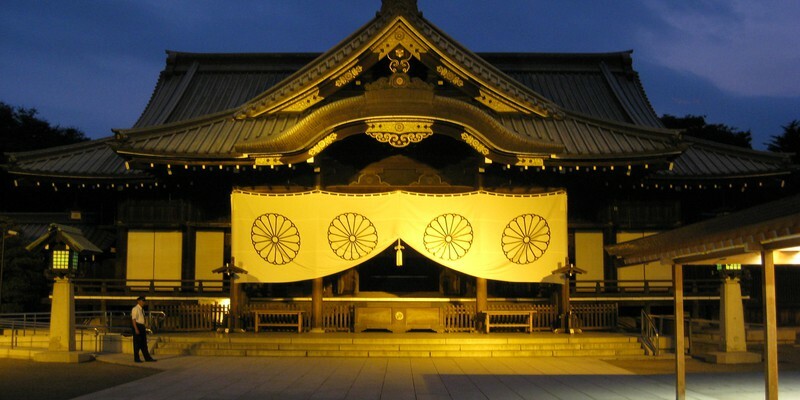 Studying Yasukuni and the Yūshūkan is thus not just a matter of identifying historical truth: it is fundamentally about understanding Japan’s present situation and shaping Japan’s future. Of course, all nation-states exhibit nationalism in their own ways—Japan should not be considered a special case in that regard. But in order for Japan to move beyond its wartime past in a broader sense, the nationalist attitudes inherent to Yasukuni Shrine and the Yūshūkan have to be separated from the meaning of modern Japanese patriotism. Japan must decide what type of nation it wants to be: one that returns to the past in an effort to revive a bygone national identity (and suffer the consequences of doing so), or one that attempts to channel its national pride constructively and work towards creating an identity more fitting of its current potential. The photo featured in this article is licensed under the Creative Commons 2.0. The license can be found here. The original photo, entitled “Front Shrine of Yasukuni Jinja” was taken by Yasuyuki HIRATA. No changes were made to the original photo, which can be found here.